Thomas Andrew Kelley II is a talented musician who reveals his craft through the percussive arts as a performer, arranger, and composer. A native of Pasadena, California, Thomas has been performing since the age of four exploring instruments such as piano, violin, trombone and drums until discovering his musical heart in the many rhythms Afro-Latin and West African percussion. 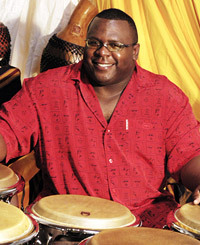 As a percussionist Thomas has performed internationally in various ensembles and styles ranging form Salsa, African Drum & Dance, New Orleans Brass Band, Classical, Jazz, Drum Corps & Marching Band, Funk and R&B. His versatility and depth makes him an essential part of any project needing percussion from conception through presentation and beyond. As a featured musician, Thomas was an integral part of creating the ethnic percussion landscape for Billy Childs': The Distant Land, An African American Composer's Project. Other performances among his impressive list of shows include Disney's Lion King Show and Eureka, American Idol, Super Bowl, and the Symphonic Jazz Orchestra. In addition he has shared the stage with great artists such as Lesa Terry, Munyungo, Orestes Vilato, Changuito, Dramane Kone, and Leon & Jah Amen Mobley. Freelance percussionist work keeps Thomas busy around the LA area and abroad with various groups and artists. He also teaches privately in his percussion studio and gives drum workshops and clinics throughout LA and Orange county in various school art programs.